The Saklan School offers a unique, integrated approach to your child’s elementary education experience. Our small class sizes means Saklan teachers have the ability to focus on your child as an individual, and create an authentic sense of community in the classroom. Students at Saklan School appreciate each other’s unique qualities and contributions. Students have access to a learning environment that is caring, challenging, differentiated and provides a successful balance between academics and enrichment. Our small class sizes encourages students to feel comfortable to take intellectual risks and think outside the box. developmentally spirals and teachers create meaningful learning opportunities through manipulative, cooperative learning, problem-solving, and real-life applications. Our classroom teachers provide many opportunities and experiences for students to learn language in all its varied forms-reading, writing, presenting and listening. 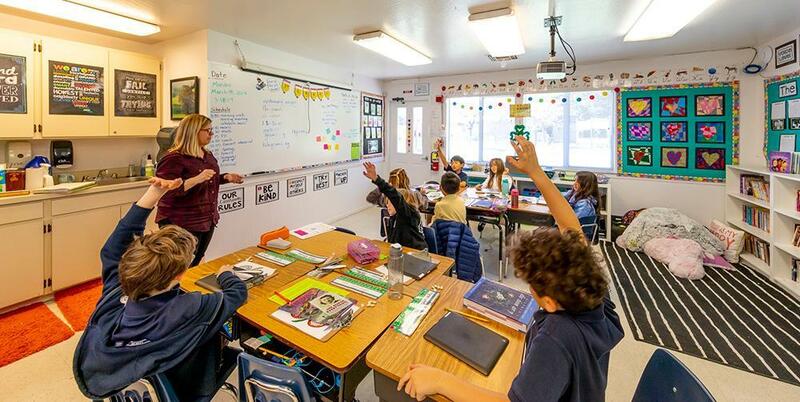 Built around the strong connections between reading and writing through core literature pieces, the Language Arts curriculum provides students with the language abilities needed to communicate effectively. Literacy is also integrated into many other aspects of the school day including meetings, art, science, math and social studies. The social studies program follows a specific continuum. An integrated approach is used to connect with all the academic areas that are being taught. The program also seeks to develop a respect and understanding for individual differences and commonalities. Science is taught by the classroom teacher and the Middle School Science Specialist. The classroom teacher provides interesting lessons incorporating Next Generation Science Standards. Science lessons provide rich content and hands on experiences. Students also go to the science lab and go in depth into the scientific method with the science specialist. The Saklan School has a newly designed state of the art science lab for students to utilize. 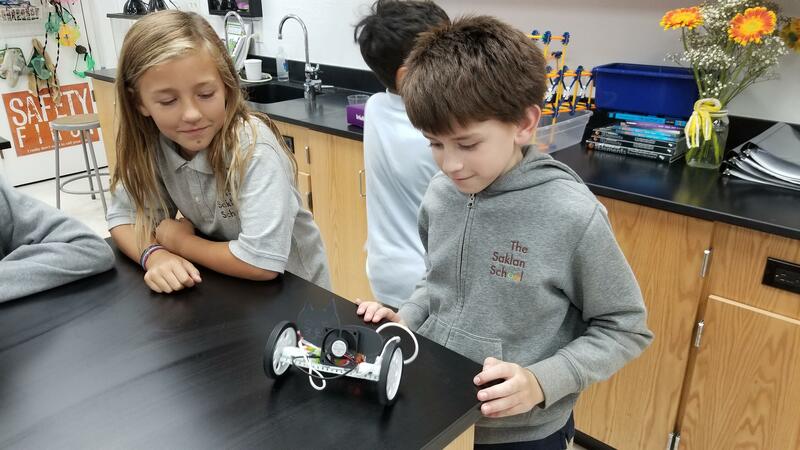 Students in the Lower School have many meaningful activities to build on their love of science and its real-world applications. In addition to core subjects, we also offer Spanish, Music, Art, Physical Education, and Library, all enhance your elementary student’s ability to discover more about themselves and the world around them. The Lower School Spanish program makes foreign language learning a cultural adventure. Through cultural-awareness activities we focus on the gradual development of listening, speaking, reading, and writing skills in each level to foster a positive attitude toward language learning. Students in the classroom are exposed to a variety of activities in which they engage to access the content. When possible, tiered activities are provided to allow students to work at the same content but with different level of support. We also leverage technology to allow students to experience the concepts and content of the program to provide opportunities for students to work independently to practice and reinforce their emerging skills. The Visual Arts department at Saklan offers a truly unique, challenging and contemporary arts curriculum. We believe that the arts are best expressed through each child’s own voice, imagination, and eventually his/her mark. At the Saklan School, we believe that an understanding of art tools, techniques, and theories can and must be applied across all disciplines. 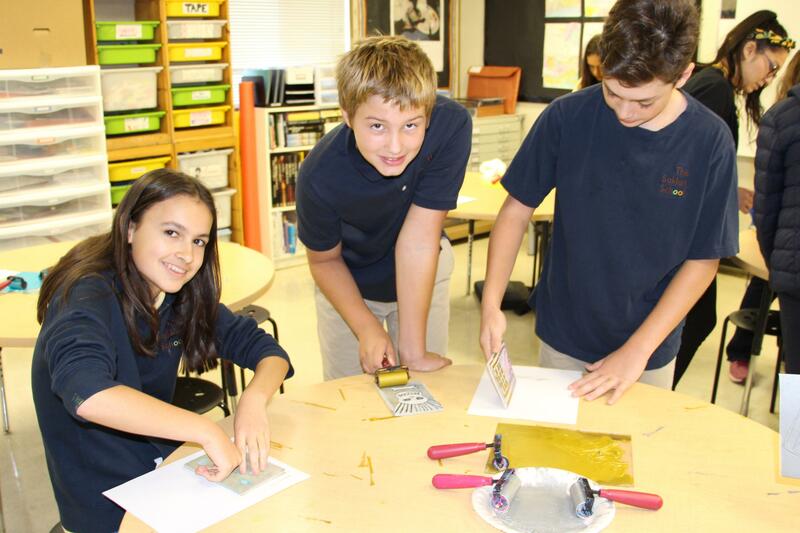 The goal of the art classes is to help develop creative, confident and independent learners. Our Physical Education provides our elementary students to explore the relationship between practice (routine, repetition, and intensity), and motor skill acquisition. Students learn how to learn by helping each other. They practice how to organize and cooperate for healthy competition. If conflict arises, students experience how to resolve issues in a constructive manner. Emotions surrounding games and attitudes towards facing challenges are discussed. Every student has the right to feel comfortable in order to learn at their own pace and accept new challenges. To promote student movement, time for recess is provided daily, and physical education classes meet three times a week. First grade is an important time in a child’s life. They’re evolving in important ways, intellectually, emotionally, and physically. At the Saklan School, we look to support our first graders in their growth, and develop a strong sense of community within the classroom. Math is integrated throughout the day from morning calendar activities to various projects that require counting, measuring, estimating and other skills. First grade focuses on place value, graphing, algebra, geometry, addition and subtraction facts through double digits up to 99 and problem solving using various strategies. Skills are /using manipulatives, group, and independent practice. First graders read and write a variety of texts. Emphasis is placed on phonemic awareness, sight words and spelling patterns in reading and writing. Editing for grammar, punctuation, and sentence structure in informational and creative writing increases throughout the year. Students present oral reports and memorize, recite, and perform poetry frequently. The Wonders language arts program incorporates all of these skills in whole group and independent practice lessons. Students develop an understanding of Social Studies by studying their own place in space and time. Students learn about their place in the community and compare rural, urban and suburban communities. They also learn about our North American neighbors: Canada and Mexico. Global emphasis is placed on multicultural folktales and homes around the world units. Science is taught through thematic units and is integrated into other parts of the curriculum. Units include space, simple machines, penguins, plants, weather, earth materials and pond life. Students sort, classify, compare, investigate and observe as they use the scientific method. First graders make three-dimensional constellations and inventions as well as many hands-on experiments during these units. Spanish classes emphasize interactive activities, stories, songs and games that are used to introduce vocabulary and commonly used phrases in Spanish. Students also engage in Art projects to help them draw association to the Spanish material as they speak and create. Science/STEM Lab focuses on introduction to coding; discovering what is inside our bodies, and human life stages. The first grade Visual Arts program builds a deeper focus on the small motor skills learned in Kindergarten. While building skills using materials and techniques such as, drawing, painting, storytelling, and sculpture, the students begin to learn technical vocabulary. Freedom of expression and choice within each project provides the students an opportunity of self discovery. Field Experiences : The benefits of learning through Field Trips. It is important to prepare students by developing their visual literacy and by integrating the trip actively into the curriculum. Chabot Space and Science Center, Lindsay Wildlife Museum, and St. Mary’s College are some of the school trips we provide for the first graders. Presentations: First grade students has three presentations in a year. The following presentations are Space Unit, Invention Show and Homes Around the World. Presentation skills are important to help the students communicate with confidence, motivate the audience (parents and families) to listen to their report and it becomes an important element in delivering positive learning experiences. In addition to twice daily recess on our turf and climbing area, our first grade students meet together for Physical Education courses throughout the week. Maria Puno has been an educator since 1996. 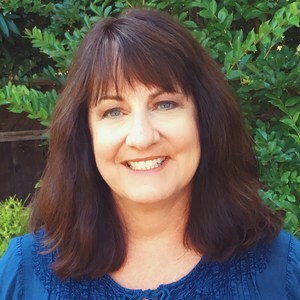 She began her career as a preschool teacher and taught at various schools in the East Bay. 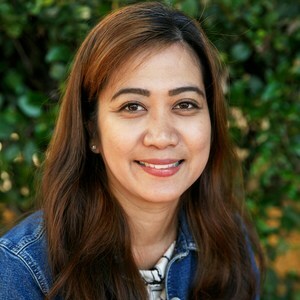 Prior to teaching at Saklan, she worked at Sylvan Learning Center as a tutor where she taught Beginning Reading and Math to children between the ages of 5-8 and Academic Reading to 1st to 5th grade students. After a couple of years she was promoted to Director of Education. She moved on to Kindercare where she was hired as a Program Specialist and later on promoted to Assistant Director. Maria became part of the Saklan community beginning in 2008. She started in the ECE program and transitioned to 1st Grade Teacher in 2012. Her philosophy is for children to learn and have fun at the same time with an ultimate goal of helping every student reach their fullest potential. Outside of work, she enjoys cooking and her family likes going out to different restaurants to taste and explore different types of food. She also loves to watch HGTV and Food Network. Second graders are at an age where they are striving to understand the curious world around them and, in the right environment, have an amazing capacity to learn and thirst for information. At the Saklan School, we provide an abundance of learning opportunities in a safe, personal environment to help each second grade student blossom. Math is integrated into all subjects. Students learn place value, fact families, computation and regrouping (+/-) up through four digits, graphing, fractions, money, time, geometry, estimation, algebra and measurements. Single digit multiplication and division up through at least 5 is also taught. Special attention is given to critical thinking and problem solving. Students learn reliable spelling strategies and editing that they can apply to both familiar and unfamiliar words, and are expected to be accurate and precise in spelling and grammar. Nouns, Pronouns, Adjectives and Verbs are emphasized. The students learn to read and write a variety of texts, and write and “publish” many multiple page stories, book reports, and books. Public speaking is a major emphasis, with many oral reports and poetry recitals being a feature of this year. Cursive is also introduced in second grade. Students progress in Social Studies, from learning about where they live to where they are from doing their “Family and Heritage” unit. In class the students become immigrants, passports included, and write stories about coming to America. Other units include continents/maps, Native Americans and pilgrims, presidents, and people who made a difference (biographies). Our integrated Science curriculum develops students’ ability to understand scientific concepts through various forms of learning which include creative writing and mathematical equations. They learn about dinosaurs and fossils, mammal and animal classification, inherited characteristics, natural resources, sound and hearing, light and colors, vision, whales, ocean animals, magnets, motion, gravity, and force. Spanish Language emphasizes interactive activities, stories, songs and games that are used to introduce vocabulary and commonly used phrases in Spanish. Students also engage in Art Projects to help them draw associations to the Spanish material as they speak and create. Reinforcement and repetition are used to help retain material. Science/Stem lab focuses on observing rocks and minerals and investigating forces and work. Students deeply explore the Seven Elements of Visual Art. As the students grow into understanding the world and representation, the elements of art help the students create with techniques, methods and tools. This lays down the groundwork for further study of the arts in later grades and develops an understanding of subject matter and composition. Second grade students are introduced to a larger art vocabulary in the process and a beginning understanding of arts through a historical context. In addition to twice daily recess on our turf and climbing area, our second grade students meet together for Physical Education courses throughout the week. Yette is originally from England and completed her teaching training at Greenwhich University. She moved to the Bay Area in 2012 with her husband and three boys. She has been teaching at Saklan since 2015. 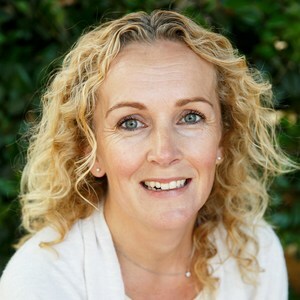 Her educational ethos includes starting with the individual child and creating a fun, active learning environment with high expectations, where all children can achieve fully, while developing a love of learning that will last a lifetime. Outside of school she enjoys hiking, swimming, running, yoga, and generally trying to wear out her three teenage boys and their dog! Third grade students often have an enthusiastic, energetic approach to learning. They’re building skills and gaining confidence. At the Saklan School, we leverage that enthusiasm to fuel a lifelong love of learning. Third grade math focuses on problem solving approaches emphasizing strategies, applications and problem formulation. Students learn computation & regrouping, double digit multiplication and division up to 12, decimals and fractions, geometry, fractions, statistics & probability, graphing, estimation and algebraic applications. Students use hands-on activities, mathematical projects & manipulatives that make math fun and memorable. Through a variety of literature, students learn to read for comprehension, explore word meanings, write using correct grammar and mechanics, and use their listening and speaking skills. Students learn to use resources such as dictionaries, thesauruses, and the internet. Well organized, appropriately structured paragraph writing is emphasized. Students learn and master cursive handwriting. Students study the geography of the United States and the world, westward movement, local Native American tribes, and pioneer life. These units are enriched through various arts, crafts, writing, literature and drama. Students also enjoy an overnight pioneer camp where they live as pioneers. In third grade emphasis is also placed on hands-on activities including numerous experiments using the scientific method. Students are involved in various research projects during each unit of study. With each unit students are given the freedom to choose the subject, within a given framework, that they wish to research thereby promoting interest and encouraging responsibility. Plants, animal life, solar system, and rainforests are some of the units of study. Spanish classes emphasize interactive activities, stories, songs, and games that are used to introduce vocabulary and commonly used phrases in Spanish. Students also engage in Art projects to help them draw associations to the Spanish material as the speak and create. Reinforcement and repetition are used to help them retain material. Science/STEM Lab focuses on investigations into elements and compounds; observing physical changes and investigating changes in our atmosphere. The third grade students study Visual Arts through a historical and cultural lens. Through the arts, they will learn to appreciate other cultures and people. Drawing skills are redefined and open to interpretation. The students will explore the various reasons “why” art is created and begin to analyze, reflect and derive meaning from works of art, including their own. In addition to twice daily recess on our turf, climbing area, and sports court, our first grade students meet together for Physical Education courses throughout the week. Lisa grew up just down the road from Saklan in Orinda, CA. She received her Bachelor's degree in Biology from UC Santa Barbara and her teaching credential from San Francisco State University. 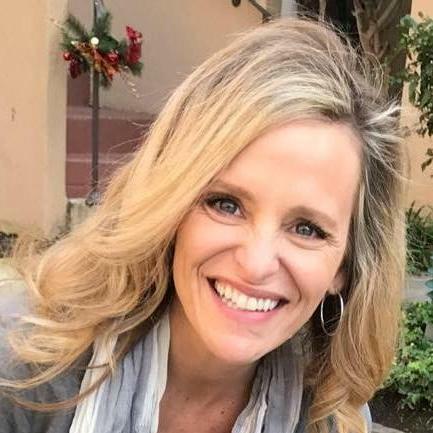 Lisa taught high school Biology for several years at a few local schools, including Acalanes High School and Las Lomas High School, before taking a break to raise her children James and Emily. In 2015, with her children nearing college, Lisa decided to resume her career and began teaching 5th grade at Saklan. The decision to teach at Saklan was an easy one for Lisa based on her long history and deep involvement with the school. It all started back in the 1980's when her younger brother was a student at Saklan (previously named The Carden School), and she drove him to and from school every day. In 2004, she enrolled her own children at Saklan and spent the next ten years serving in various roles, including room parent and auction chair, as well as multiple positions on both the Parent Association Board and the Saklan Board of Trustees. 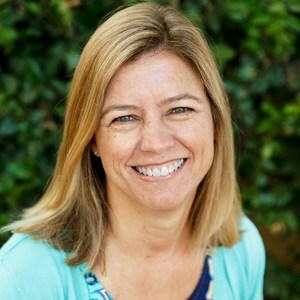 She believes wholeheartedly in the school's mission of thinking creatively, acting compassionately and living courageously, and strives to incorporate these ideas into her classroom lessons each day. Fourth grade students often show rapid emotional and social growth during this phase of their life. At Saklan, we create a nurturing, comfortable, and safe environment, allowing your child to feel secure so they can continue to flourish intellectually and academically. Students study Math through work on numeration, computation, and regrouping numbers through the millions. They multiply and divide multiple digits, add and subtract fractions and decimals. Fourth grade math gives students a greater understanding of measurement techniques, geometry, and algebraic thinking. Students learn the standard and metric measurement units, learn to graph and interpret data using a wide variety of tools. 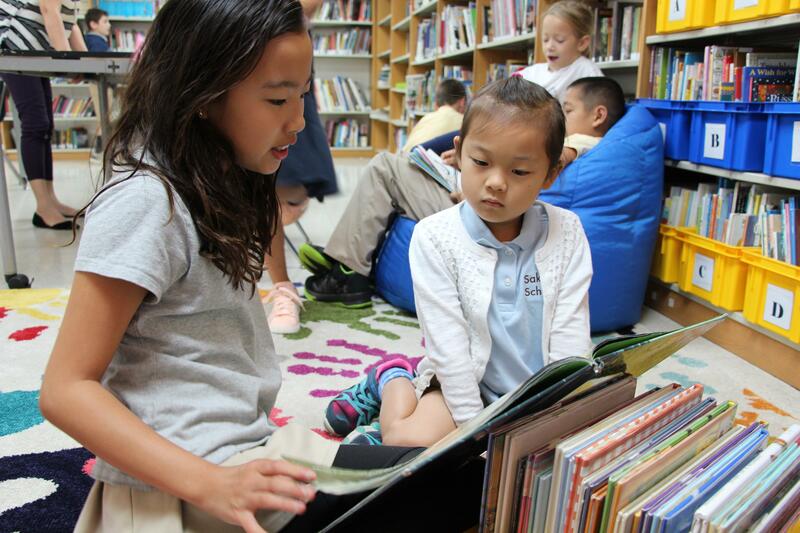 Students transition from learning to read, to reading to learn. Students read a lot of non-fiction text to collect information. Content related literature is integrated into the social studies and science curriculum. The focus is on reading comprehension. Students are exposed to various kinds of literature and continue to write letters, responses, essays, fictional pieces, poems, and several research reports. Students expand on their Social Studies by learning about California’s geography and history. They start with Native Californian tribes and recognize how various geographic regions determine the Natives’ resources. They study explorers who sailed to the Americas, look at the mission and rancho period (with an outdoor educational excursion to Mission Dolores), and experience the prospectors’ adventurous lives in the foothills with an overnight trip to Coloma. Students use the scientific method with experiments. They learn to formulate predictions and justify them based on cause and effect relationships. Topics covered are: changing earth (weathering), electromagnetism, magnetism, and plant and animal adaptations,. Within each unit the students have the opportunity to learn and observe from experiments. Students learn keyboarding, working on Chromebooks in the classroom. They integrate technology with every subject, specifically learning to create Google Docs and Slides, and use technology to research. Spanish classes emphasize everyday conversational topics and vocabulary with an aim towards comfortable fluency. Science/STEM Lab focuses on investigations into electricity and exploring energy. Fourth graders explore their identity as an artist and are introduced to Modern and Contemporary art. The students will be encouraged to further define their mark by using current events and individual experiences as a source of inspiration in their own art. As they find their style, students work on accuracy in proportion of the face, value scale and the three- dimension in drawing and sculpture. My name is Shellie Burton and I’m so excited to be joining the Saklan family this school year! I have a degree in Education from Concordia University Texas, where I taught public school in both 5th and 4th grades. For the last 3 years, I taught 4th grade in Huntington Beach, CA in a private school. Words cannot describe how thrilled I am to find Saklan, and be hired to teach my favorite grade!!! I have three beautiful children, the last baby just moved out… so I am a new empty nester! They have all spread their wings and are pursuing the arts in one capacity or another! 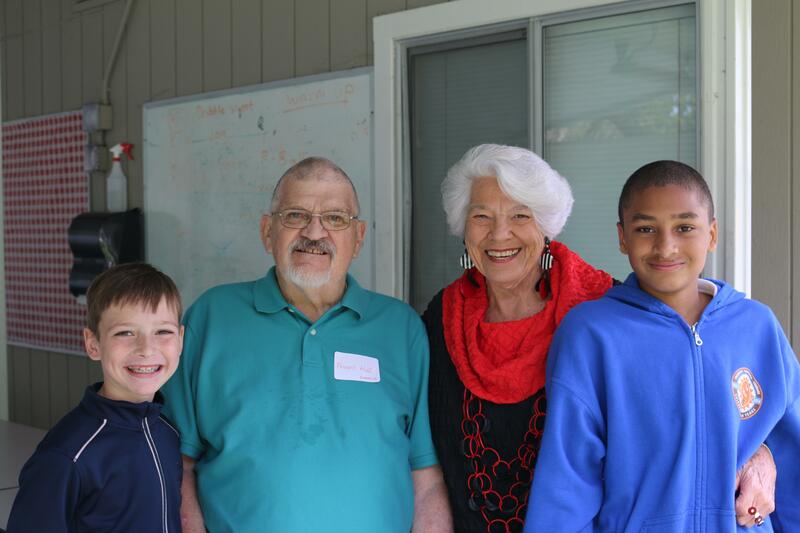 Recently, I have moved back to Northern California, where I grew up, to be closer to my ageing parents. 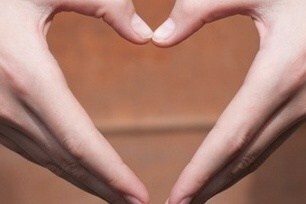 As a lifelong learner myself, I want children to love to come to school! My classroom will be a safe learning space for all students to take risks, make mistakes, and cheer each other on to achieve Personal Best! I look forward to the great learning adventures we will have this year! Fifth graders are growing leaps and bounds in their social-emotional, cognitive, and language development. At the Saklan School, we leverage these common characteristics to promote community, leadership, and problem-solving to teach to your whole child. Fifth grade is a huge transitional year for students. They are getting prepared to move seamlessly into Middle School and are academically and emotionally ready to take on that challenge. Fifth graders are given many opportunities to build on their skills used for group and independent projects. Fifth graders are taught the importance of organizational skills, time management and study skills throughout the year. 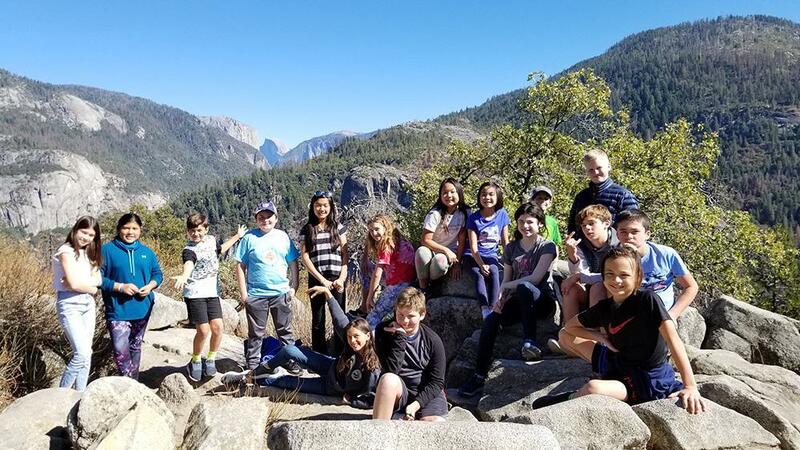 Fifth graders go on many exciting field experiences. Students visit the California State Capitol Museum and learn more about the branches of government and how laws are made. In the spring fifth graders attend a two night experience for outdoor education at the Marin Headlands. This program encourages an understanding of the basic principles of ecology through instruction and hands-on experiences that expandson the science content and build their sense of community at this seaside location. Math learning emphasizes problem solving strategies, where students work independently, as partners, and in groups to develop critical thinking skills. 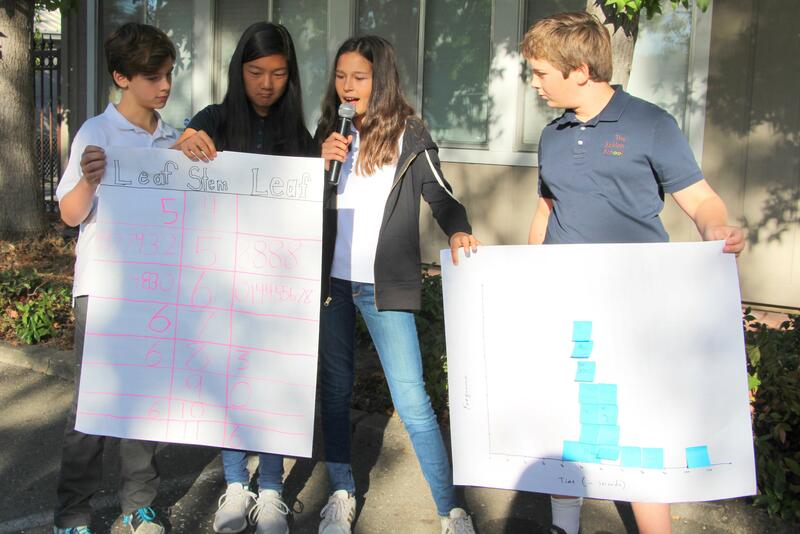 Fifth grade math curriculum is California Common Core aligned and incorporates analytical thinking, and applying these concepts in real-world applications through numerous project based opportunities. Students also have regular access to highly engaging online math programs that are differentiated. Writing emphasizes the succinct development of multi paragraph essays. Students use a variety of writing elements in order to enrich their writing. Students become proficient with utilizing enhanced vocabulary, sensory words, creating exciting leads and adding effective dialogue. Students develop their writing skills by: self editing, peer editing and writing groups. Reading comprehension through fiction and non-fiction works emphasizes plot recognition, character development, inferences, main ideas, theme and text dependent answers. The writing program culminates with an Author’s Writing Celebration. Fifth grade Social Studies focuses on United States Early History. Fifth graders have many project based experiences to enrich their understanding of our nation’s early history. Instruction closely examines our cultural and ethnic diversity and how this “great experiment” has created a country of one national identity while valuing the uniqueness of each individual. Main topics covered are: Early Colonization; American Revolution (Causes and Effects); Constitution (Branches of Government); Westward Expansion; Civil War (Causes and Effects). Students also develop their skills with summarizing texts, taking notes, how to research topics and the skills required. This instruction incorporates two research reports and a Passion Project to present. Science instruction incorporates the ability for students to analyze, interpret, evaluate, and comprehend the world around them in meaningful ways. Instruction is presented by the classroom teacher and the Middle School Science specialist. They continue to understand the scientific method and develop further their reasoning skills. They focus on the following topics: weather, plants and animals, solar system, water, and the scientific method. The classes are inquiry based and thematically focused. Students’ assessment consists of projects, portfolios, class participation, homework, and labs. Science/STEM Lab focuses on investigations into Space and Ocean Ecology. Fifth grade students are introduced to the traditional principles of design (harmony, balance, rhythm, movement, emphasis, contrast, etc.) in the Visual Arts program. Principles of post-modern design, such as mixed-media, layering, juxtaposition, and interaction of text and image, will be explored through various art materials and mixed-media techniques. Students learn how to articulate themselves during reflection points and group discussion art critiques using art vocabulary. In addition to twice daily recess on our turf, climbing area, and sports court, our students meet for Physical Education courses three times throughout the week. Mrs. Peters has lived in California for most of her life. She has been an educator for over twenty years. During that time she has taught students in grades K-6 and been a mentor teacher to many colleagues throughout her career. The opportunity to teach and impart her love for learning with her students is an integral part of her teaching style. In addition to being an accomplished teacher, she has also been a Talented and Gifted Specialist for students in grades 3-5. She received her Master's Degree and Administrative Credential from St. Mary's College. Mrs. Peters was a Student Teacher Supervisor with the credential program for three years at St. Mary's College. Educating and mentoring teachers is a true passion for her. Currently, Mrs. Peters lives in Danville with her husband and two children. Mrs. Peters is excited to bring her experience and dedication to her students. She is looking forward to being a part of the Saklan community and instilling in her students the desire to be life long learners.